In a post-Lynda Carter age, we’ve come to expect subpar or else mediocre superhero films. And then comes Gal Gadot who by whatever miracle or sequence of events ends up as the new Wonder Woman. She fills Carter’s shoes quite admirably. 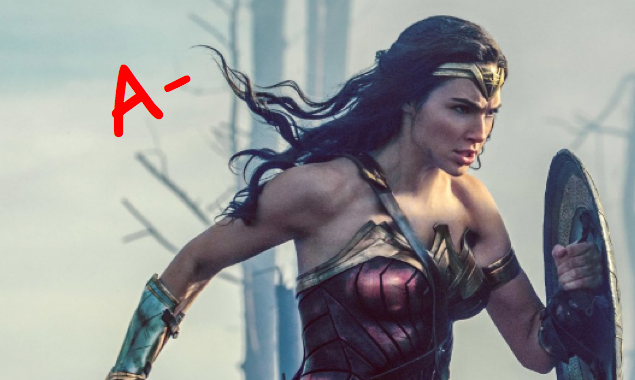 Word has it that even Lynda has praised Gadot's performance! We begin before the creation of the world when Zeus, the king of the gods, creates his servants of men. Jealous, Aries, the god of war, protests and wages a battle from the foundation of the world. This battle is at the root of the fate of humanity. Even for Zeus, striking down Aries comes at great cost, but he knew that his work wasn’t finished, so he created a secret weapon, the god killer. And thus we begin with the story of the Amazonians, those who have lived by divine will in complete isolation, dreading the day they would be found by Aries and the dreadful war of old would resume. We start with a young Diana (aka, a young Wonder Woman) who is anxious to learn the ways of war, and she has many great role-models among the goddesses of Amazonia to teach her. But her mother, "Hippolyta" (Connie Nielson), Queen of the Amazonians, forbids it. When the day comes that she can no longer be contained, Diana comes in contact with a downed fighter pilot, "Steve Trevor" (Chris Pine). It is during World War II that she is introduced to a very non-Greek mythology-dominate world. The ideological debates between a daughter of Zeus and a 20th century male are, to say the least, worth a few smiles. Gadot's and Pine's chemistry may be more brother-and-sister than unlikely matchup, but here, it doesn't matter. Wonder Woman will simply not allow you to leave without being stimulated. It has treats for everyone, but it could be called a slow starter. And as to why this needed to be laid out in yet another tired WWII setting is anyone’s guess, as is why the writers took so much time introducing us to multiple layers of Diana’s childhood years apart at a time. The script at times relies on drawn-out and dramatic lines in the intense back-and-forth of battle scenes: “I believe in love!” – the likes of which, if they were used anymore than they are, would majorly detract from the viewing experience. As they are, we can forgive them in the name of general audience merriment. Director / writer Patty Jenkins (Monster, 2003 / Arrested Development, 2004) did us a great service in most of what she chose to impart to audiences. And yet, as with many a great movie with a big budget and an appreciation to detail that happens to equal its drive to thoroughly entertain us, we have an awful lot going on—too much, in fact. This is felt in the film’s lengthy runtime, which we can feel the squeeze of at right about the halfway point. But if pacing is the second biggest struggle here, we are still doing quite well. Many a superhero movie suffers from a lack of the right quality of villain, and this one is no exception. The dialogue, though generally crisp and thoughtful, is interlaced with lines given to a supporting cast that manages to take up a lot of screentime. Still, those performances are tonally matched for the most part, making them only a slight distraction in the name of comic relief. Wonder Woman makes for an entertaining movie and a feminine statement in the superhero genre—one that, I believe, has long gone neglected. When we add everything together, we come away with an empowering, explosion-ridden action flick—charming, suspenseful, provocative to the hilt, and one that leaves us lined up for the action to continue!